The Guerrilla Box is Guerrilla Painter's most popular pochade, crafted of strong, rugged, oiled basswood laminate with stainless steel screws and aluminum hardware. Offering more than 80% of the storage capacity of a traditional French easel, it's ideal for most plein air work and supports more accessories than any other Guerrilla Painter Pochade. Most artists find that they can transport everything they need inside the spacious compartments — from paints and pastels to brushes, palettes, and mediums. It holds up to four wet panels in the lid or one wet stretched ¾" canvas, and it accommodates all 9" × 12" (23 cm × 30 cm) media. The outside dimensions of the Guerrilla Box are 10" × 13" × 5¼" (25 cm × 33 cm × 13 cm) and the inside dimensions are 9" × 12" × 4½" (23 cm × 30 cm × 11 cm). It weighs just 5 lb. Customize your Guerrilla Box with the complete accessory system available below, and grab it whenever you find the perfect spot or the perfect moment. Mighty Mite Brush Washer — Measuring 2¼"Dia × 2¼"H, with a 4 oz (118 ml) jar, the Mighty Mite is ideal for use with your Guerrilla Box. Guerrilla Box Kit — This set includes a Guerrilla Box, Web Shoulder Strap with Shoulder Pad, Large Mouth Single Palette Cup, Mighty Mite Brush Washer, Set of 4 Flat Pocket Bristle Brushes, 9" × 12" Plein Air Gessoed Panel, and Composition Finder, plus A Guerrilla Painter's Notebook volumes 1 and 2 (containing company founder Carl Judson's essays on his adventures in Guerrilla Painting). Paper Towel Holder — A must-have if you use paper towels when painting! Made of aluminum and stainless steel, the clips slide onto the wall of the TravelBox. It stores compactly within the box when not in use. Palette Extension Kit — Right and left-hinged palette extensions create room for full access to 4 Foam Bottom Pastel Trays while working. Includes parking slots for the Hang-Up Brush Caddy. Plywood and aluminum construction. Covered Palette Tray, 9" × 12" — Suitable for use with watercolors, oils, or acrylics, this covered palette tray is constructed of extra-durable, double-thick, high-impact white polystyrene and features a tight-fitting lid. Oil painters find it a great way to keep their equipment neat and tidy while saving their paint for several days. Watercolorists who like to use butcher trays feel right at home because of its unrestricted work area. 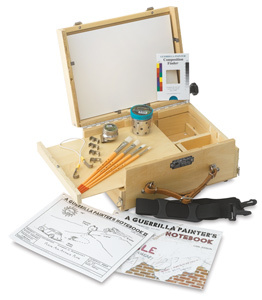 Slip-In Easel, 9" × 12" — The Slip-In Easel by Guerrilla Painter allows you to paint with more gestural brushstrokes because it holds your panel or canvas up and away from the lid of your Guerrilla Box. It is crafted of lightweight yet sturdy corrugated enameled aluminum with adjustable metal fingers that accommodate panels up to 12" high by any width. Use it alone or in combination with the Guerrilla Box Telescoping Easel (sold separately). NOTE — The Slip-In Easel limits the carrying capacity of the Guerrilla Box to one wet panel. Telescoping Easel — This super-compact telescoping easel allows your Guerrilla Box to accommodate panels or canvases up to 20" high. It attaches easily to the lid using existing screw holes and never needs to be removed. Use it alone or in combination with the 9" × 12" Slip-In Easel (sold separately). The Telescoping Easel is crafted of aluminum and high-impact plastic and weighs just 6 oz. Hardware is included. Brush Tray, 4-1/2" × 12" — This popular, high-quality plywood brush tray fits easily in your Cigar Box while leaving room for up to 10, 37 ml paint tubes or other supplies beneath it. Hang-Up Brush Caddy — You won't want to be without the super convenience of this caddy, which stores in the 9" × 12" Brush Tray and holds 10 or more brushes. Hang it on the edge of your Cigar Box and you're ready to go. It's made of white enameled aluminum for easy cleanup.